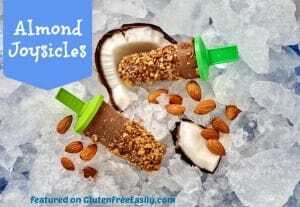 Like frozen candy bars, these Almond Joy Popsicles (Almond Joysicles for short) get a little extra flavor and texture from a coating of toasted almonds. It’s an easy garnish that’s worth the extra step. Preheat the oven to 350 degrees F. Spread the almonds on a baking sheet and toast them for 8 to 10 minutes, until light brown. Set aside to cool. In a blender, combine the almond milk, cream of coconut, and chocolate syrup. Blend until smooth. Stir in the coconut. Pour the mixture into popsicle molds. Add sticks and freeze for 6 to 8 hours. Before eating, spread the toasted almonds on a plate. Unmold the pops and let them sit at room temperature for 1 minute. Roll and press them into the nuts to coat the outside of the pops. Eat immediately or freeze again until needed. I'm guessing that you can really play around with this recipe depending upon your own personal preferences and needs. For example, if you're one who tends not to eat much in the way of sugar, subbing unsweetened alternatives for one or more of the ingredients (e.g., unsweetened shredded coconut, coconut cream concentrate) may work just fine because there may be just be enough sweetness for you in another one of the ingredients you're already using in this recipe (such as chocolate syrup). Use a dairy-free chocolate syrup to make these popsicles dairy free. Makes four 4-ounce popsicles. Recipe from California Almond Board.